The cell. 7. Intermediate filaments. Atlas of plant and animal histology. 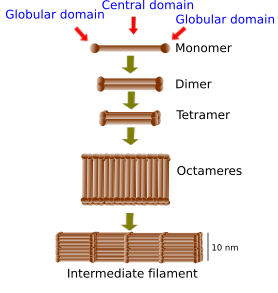 Intermediate filaments are one of the components of the cytoskeleton providing mechanical strenght. They are usually anchored to the cell adhesion complexes. Intermediate filaments are distributed through the cytoplasm, and are also a component of the nuclear envelope. Intermediate filaments are made up of proteins with three molecular domains: two globular domains and one central straight domain. There are several types of intermediate filaments, such as keratin. Intermediate filaments are a primary component of the cytoskeleton. They withstand mechanical stress, mainly stretching. This role is clear in animal cells. 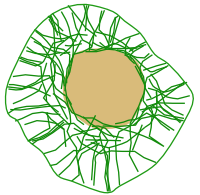 In plant cells, however, counteracting mechanical forces is carried out by the cell wall. Intermediate filament proteins have been found in plant cells, but their function is not fully understood. The diameter of intermediate filaments is 10 to 12 nm, between 7-8 nm of actin filaments and 25 nm of microtubules. That is why the name intermediate. Intermediate filaments are found in the animal cells, but also in plant and fungi (not like long filaments since they have cell wall). Intermediate filaments form a net that spreads from the nuclear envelope to the plasma membrane. They are usually anchored to adhesion cell complexes such as desmosomes, hemidesmosomes and focal adhesions. They are also found inside the nucleus as nuclear lamina, a component of the nuclear envelope. Intermediate filaments are abundant in those cells under heavy mechanical stress, such as nerves, muscle cells, and epithelial cells. Distribution of intermediate filaments in an animal cell in culture. In humans, there are 70 genes coding for proteins that, after polymerization, become intermediate filaments. These proteins contain a globular domain in the C terminus end, another one in the N-terminus end, and, between them, a large central domain containing about 310-350 amino acids. The central domain shows an α-helix structure, which is responsible for the association of these proteins to form dimers. Two dimers are laterally associated to form tetramers, and tetramers join to form a sheet of eight tetramers. This sheet rolls over itself (coiled structure of about 10 nm in diameter) and gets aligned with other three to form a basic unit (around 60 nm in lenght), so that several basic units join by their ends to form intermediate filaments like long ropes. The different types of intermediate filaments show proteins with similar central domains, both in size and amino acid sequence. However, the globular domains show differences in amino acid composition and in shape. Globular domains are responsible for the interaction with other cellular proteins. Assembling of monomers to form intermediate filaments. Intermediate filaments are flexible and resistant, two features to withstand mechanical stress. It is estimated that they can be stretched about 250 to 350 % of the resting length, because the monomers may slide over the others. On the contrary, microtubules and actin filaments are quite stiff. Besides resistance, intermediate filaments are involved in other cell functions. For example, they are proposed as anchoring structures for molecules involved in signaling. Furthermore, intermediate filaments interact with some organelles as mitochondria, Golgi complex, and lysosomes, so they may influence their functions. Although intermediate filaments are stable during longer times than microtubules and actin filaments, they can be depolymerized and polymerized again under some circumstances like during cell movement, cell division, and when mechanical forces on cells change the direction. Intermediate filaments are divided in three families: a) keratin filaments in the epithelial cells, b) vimentin and other related filaments in connective tissue cells, muscle cells and neurons, and c) neurofilaments in neurons. The keratin family is the most diverse, so that different epithelia express different keratin filaments. There are also different types of keratin in the hair, feathers, and nails. Furthermore, keratin filaments are made up of different combinations of keratin monomers. Keratin filaments in the epithelium are usually anchored to desmosomes and hemidesomes. Epidermolysis bullosa simplex is a pathology caused by gene mutation affecting the keratin filaments. It results in blistering lesions on the skin and mucosal layers due to the weak strength of the skin against mechanical stress, because cells are not strongly attached between each other. This is one of the 75 human pathologies associated to intermediate filaments. There are also myopathies, amyotrophic lateral sclerosis, Parkinson disease, eye cataracts, etcetera. Goldman RD, Grin B, Mendez MG, Kuczmarski ER. Intermediate filaments: versatile building blocks of cell structure. Current opinion in cell biology. 2008. 20:28-34.